Far From ‘Satisfied’ & Getting Worse! 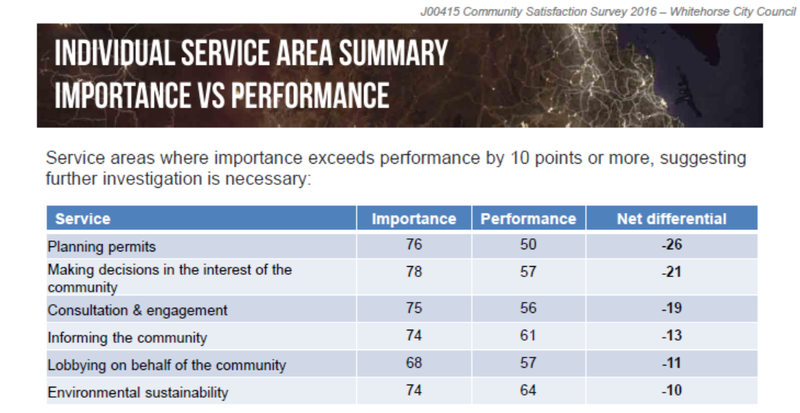 The most significant aspect of this survey which the Leader article does not focus on, is the discrepancy between resident evaluation of the importance of a service and the perceived ‘results’. Differentials of well over 20 signal a new low point in Glen Eira. For example: residents believe that ‘consultation’ is vital, giving it a ‘rating’ of 75 for ‘importance’. Their judgement on performance is 51! What should also be highlighted is that the differential between importance and performance has been growing steadily over the past few years – yet council has failed to address this decline. No amount of spin can disguise this fact! PPS – Not all councils have thus far published the results of their surveys. However, we’ve taken the opportunity to highlight some of these results as a further comparison with Glen Eira. 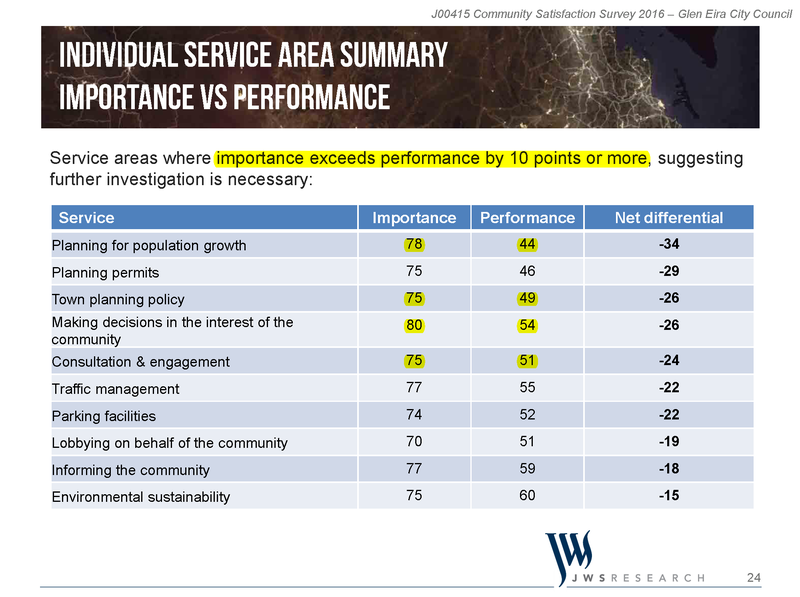 For starters, Stonnington and Greater Dandenong DID NOT HAVE ANY SERVICES WITH A GREATER DIFFERENTIAL OF 10 POINTS. The screen dumps (below) from Whitehorse and Boroondara reveal that their residents’ angst is nowhere near those from Glen Eira’s population and the number of services with a discrepancy of 10 or more points is also well below the number to be found in Glen Eira. For once I would love to see those responsible admitting that their performance is well below par. I grant Ms McKenzie some leeway since she only took over in February. It still would have been better had she not resorted to the spin and deflection that has become the standard operating procedure in Glen Eira. A “yes, we need to improve 100% and we will by doing the following” would have earned her more brownie points in my eyes than the guff she is quoted as saying. Perception is everything. People aren’t blind. They can see the overdevelopment next door to them or streets chockablock full of cars. What she should be answering is how council is going to attempt to fix these problems and when. I would even bet had more people been surveyed instead of only 400 then the findings would have been far more damning. Agree. McKenzie’s comments are disappointing. A bit of mea culpa would not have gone astray. Objector you need to realise that Statistical Sampling is highly accurate with a very small degree of error. Polls of the recent Federal Election used a sample of approximately 1500 people and were highly accurate. What we really should be concerned by is the recent loss of Senior Glen Eira staff, the reasons behind these losses and the possible effect on staff moral. This is a huge issue and one which we as a community watchdog need to keep an eye on. Some merit in your comment except for the fact that when the survey was taken all senior officers were still doing their jobs except for Newton who announced his resignation in October. Plus, the results are based on what people thought prior to February. All the old hands were still entrenched. The downturn in results can be attributed to them and current councillors. If there is a low staff morale, then so be it. Newton’s reign is over and his faithful hangerons would do well to seek other positions as Burke has been encouraged to do. Skyrail and ratecapping had nothing to do with the results. My gut feeling is that the majority of residents would be happy with a 2.5 rate increase instead of the usual 6.5. On skyrail I reckon that the majority would also favour this. She needs to find better excuses. Macca I agree the survey is the past but I am dismayed that you can just pass over and dismiss staff moral. You may think that Newton, Burke etc were not great Officers but I can tell you that they were highly respected and even admired by their Staff and the majority of Counillors. I’m also prepared to give the new CEO a go however we have some protection if Council has made a bad choice due to a normal probationary period. Glen Eira’s staff is it’s greatest asset and it has to at least remain that way and if possible approve. We will have to agree to disagree watcher. If morale is low it’s because the vibes are changing and that’s all to the good. I give McKenzie credit for getting the ball rolling. More needs to happen like getting in competent and qualified staff and making sure that our money is not wasted. Plenty of fat needs to be cut. Crucial is that residents see a culture change and an openness to resident views that was not there under Newton and Burke. 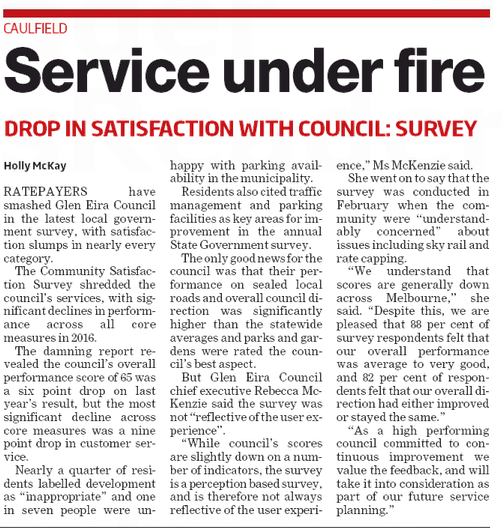 If McKenzie can deliver on this then she is well on the way to improving Glen Eira. Planning traffic consultation and environment. Council’s answer to these ongoing bugbears are ridiculous. Ten years for structure planning and maybe parking precinct plans and no tree register and no decent carbon reduction figures in any plan and more reducing resident rights with the local law. Great stuff by our councillors and admin. I’ll name those responsible – Hyams, Lipshutz, Pilling, Esakoff, Magee, Ho, Newton, Akehurst, Burke. Three have gone. The rest must follow. Results sure are nothing to write home about. A downward spiral year after year. Good to know that council is ace on rubbish though that we pay through the nose for. We need to vote in new Councillors. Anyone interested in standing?